More Apps Mth Software, Inc.
Is there a better alternative to Portfolio Analyst? Is Portfolio Analyst really the best app in Finance category? Will Portfolio Analyst work good on macOS 10.13.4? 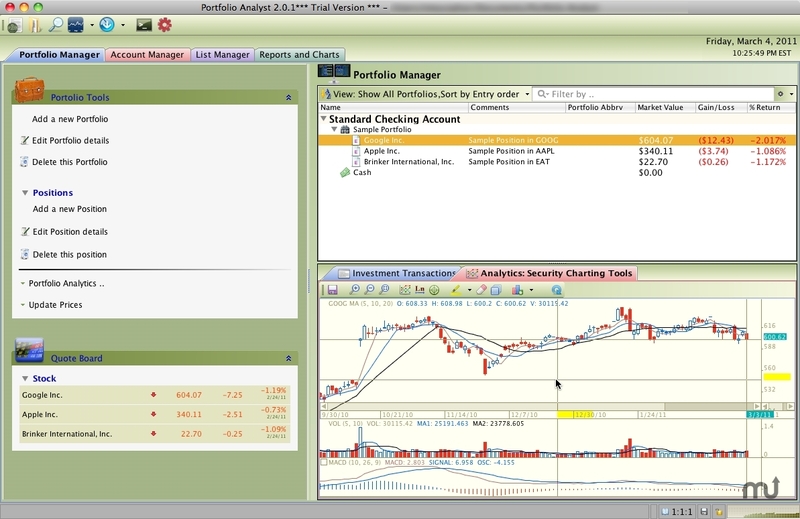 Portfolio Analyst is high quality investment portfolio management software. Portfolio Analyst offers a powerful and flexible portfolio analytics , accounting, sophisticated charting and reporting, importing data from brokerages and custodians. Whether you are a casual investor or an experienced trader, Portfolio Manager can help you set investment priorities, identify under-performing investments and verify efficiency improvements. Track stocks, funds, options, indices, etc. Retrieve prices from the Internet. Full Retina Display support on OS X. Previously rendering had been blurry. Portfolio Analyst needs a review. Be the first to review this app and get the discussion started! Portfolio Analyst needs a rating. Be the first to rate this app and get the discussion started! FIFO, AVG, or Specific Lot.